'Pallathamkulangara Thalappoli', is a renowned festival in the middle portion Kerala, it is rejoiced in the Malyalam month of Kumbam. "Daily Aarattu", "Vela", "Padayani" & "Kumba Barani Thookkam" are other special and rare ceremonies celebrated in connection with this festival. The colorful Thalappoli Festival starts with the holy festival flag hoisting in Kodimaram (the holy mast) on the day of Thiruvonam star and ends with Thookam after the holy bath ‘Aarattu’ of the procession idol on the Bharani day. The specialty of this festival is that the ‘Aarattu’ being performed through out the festival days, against the practice of ‘Aarattu’ only on the last day of the festival in other temples. 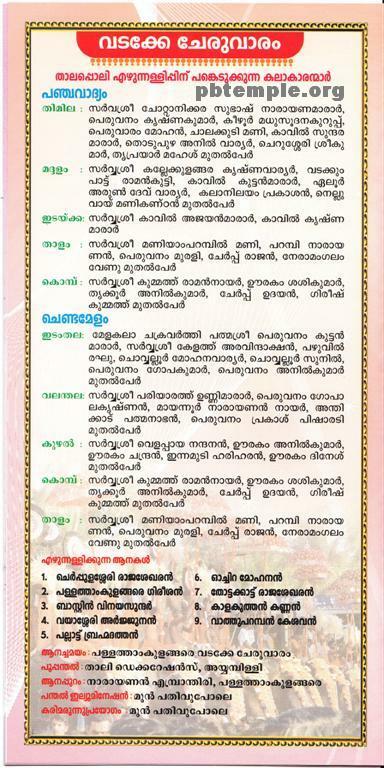 The key day of Thalappoli is celebrated on the fifth day on Uthrittathi star. Both sides, ‘Cheruvarams’ celebrate the festival in a competitive spirit and try to surpass each others performance in conducting the thalappoli mahothsavam. They compete in bringing eminent personalities in ‘Panchavadyam’, ‘Chenda Melam’ and the competition is even tougher in the matter bringing excellent elephants to the festival representing each ‘Cheruvarams’. This competitive spirit extends in conducting fire works also. On the day of Thalappoli the elephant that can keep its head in a most elevated manner will be selected for placing the ‘Thidambu’, (procession idol of the Holy Mother). Escorted by the beats of ‘Paani’ (a special metallic musical instrument, round in shape, beaten with a wooden stick) the procession circles the temple thrice however; the right of possesing the ‘Thidambu’ will be exercised by either sides on alternative years. 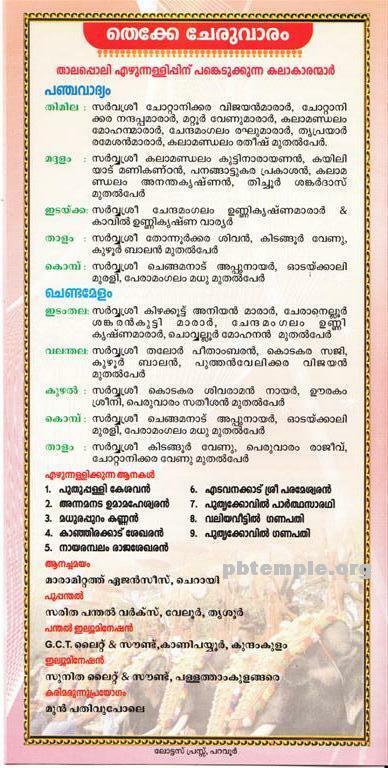 In front of the ‘Kuzhuppilly Sree Mahadeva Temple’The southern party, ‘Thekke Cheruvaram’ starts their ‘Panchavadyam’ performance, meanwhile, the northern party, ‘Vadakke Cheruvaram’ performs in the elephant stage, ‘Aanapanthal’ on the western side. ‘Chendamelam’ (beating of the traditional drums along with accompanying instruments) starts at 5 in the evening and around 6 pm both parties enter in their respective ‘Poo Panthal’ (flower decorated stages) built face to face in the western ground of the temple. Then, the battle of colourful ‘Kudamattam’, hoisting of colourful umbrellas on elephant back resembles ‘Thrissur Pooram’. 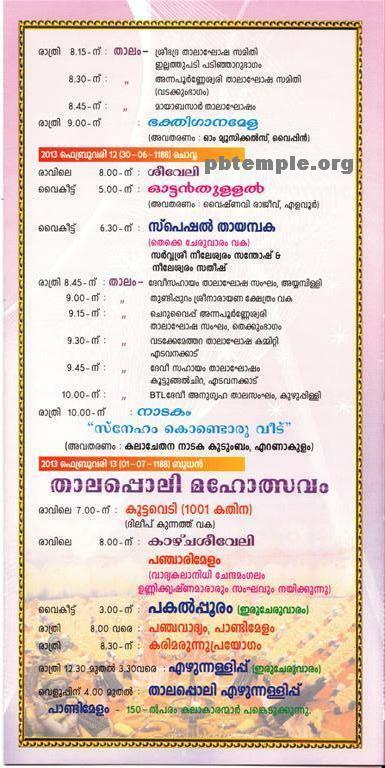 The ‘Pooram’ will be over by 8 pm followed by the fire works of ‘Vadakke Cheruvaram’ and ‘Thekke Cheruvaram’ respectively. 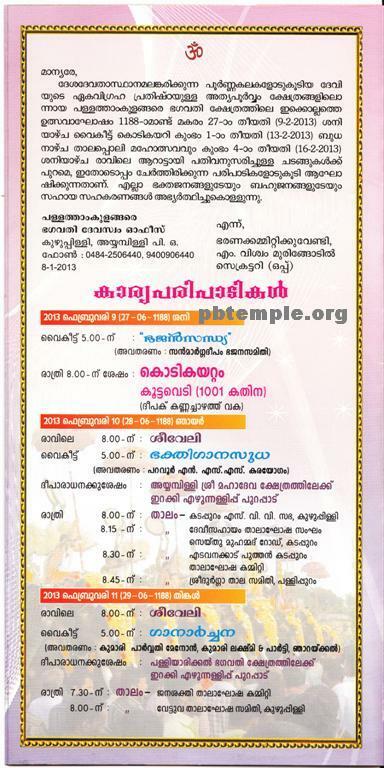 ‘Gurusi Pooja’ will be offered to the Devine Mother at night followed by ‘Thalam’ procession from different parts. The night pooram would begin at 2 am. Now the ‘Panchavadyam’ of ‘Vadakke Cheruvaram’ starts from the adjacent ‘Kuzhuppilly Sree Balakrishna Swamy Temple’ and ‘Thekke Cheruvaram’ from a place near to the ‘Kuzhuppilly Sree Mahadeva Temple’. Both of which shall have a grand ending in the above said ‘Poo Panthal’. Then both parties assembled together to join in ‘Kooti Ezhunnullippu’ (joint procession) leaving behind their competitive spirit, accompanied with ‘Pandi Melam’ and at the height of ‘Melam’, ‘Melsanthi’ escorted with ‘Nadaswaram’, after showing lighted camphor receives the ‘Holy Mother’ back to the temple, devotees with ‘Thalams’ in their hands and ‘Kurava’ joints him.